NDDC Board Members visited with Howie and Jeni Holt of eco gardens recently and got the full tour. It’s really amazing what they’ve done with the old Tires Plus site. As part of the founding family of Mother Earth Gardens in South Minneapolis, they have over a decade of experience in the business. They sold the business a few years ago, eventually moving to an old farmstead west of Northfield. 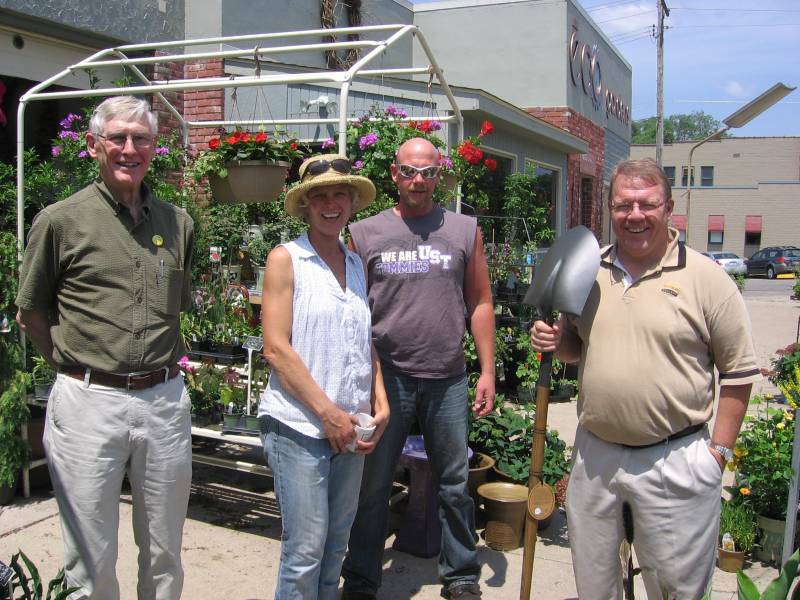 After seeing the vitality of our historic commercial district, they decided to get back in the garden store businesses. Howie and Jeni love it in downtown Northfield. They note that the market is really sophisticated, appreciates being informed, and knows quality. They also enjoy how well the downtown business owners communicate with each other, work together on collaborative efforts, and are active in the community. The business is already reinvesting in Northfield. Their landscaping project, using the familiar elements of downtown streetscape projects, was approved for a matching grant from the Streetscape Funds back in April. Howie hopes to be able to begin work soon. Their plans don’t end with that project, however. Howie told us that he’s looking at building a deck and terrace out the back door of the old garage bay. He thinks it makes sense to make use of the entire property. I’ll have to encourage the Downtown Councilors, Buckheit and Nakasian, to visit with Jeni and Howie about their plans. It would be good to help eco gardens continue to “grow”.